SeniorsAloud: HOW MUCH IS A VOTE WORTH? These days it's with some trepidation that I read the morning papers. Why so? I dread reading yet again about another round of goodies given out by our government. I have nothing against the government playing philanthropist when it comes to helping the poor, the needy and the less fortunate. Indeed these groups should be helped. But when rebates and handouts are being dished out so freely to folks who don't really need them, especially when they didn't even ask for the goodies in the first place, we can't help but view this generosity as an attempt at vote-buying. Most youths already have mobile phones, and many have smart phones. What is the rationale behind giving this RM200 rebate? It would make more sense if the rebate was for youths who do not yet own a mobile phone. The Straits Times of Singapore in an article today put the government's total handouts to be distributed from January to March this year at nearly RM4 billion! That's not counting the billions already given out last year in 2012. And not discounting more handouts in the weeks leading up to the General Elections due to be held anytime from now till June. RM300 million Youth Communication Package for 1.5 million young people aged 21 to 30 to get a RM200 rebate each on smartphones sold by selected service providers. 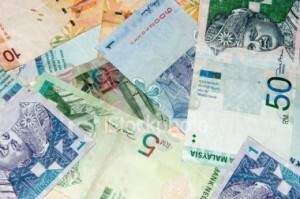 RM3 billion 1Malaysia People's Assistance Fund 2.0 (BR1M 2.0) to benefit 4.3 million households and 2.7 million singles. Households earning RM3,000 monthly or less get RM500 each, while singles aged 21 or more and earning less than RM2,000 will get RM250. RM325 million 1Malaysia Book Vouchers for 1.3 million public and private higher education students at RM250 per person. 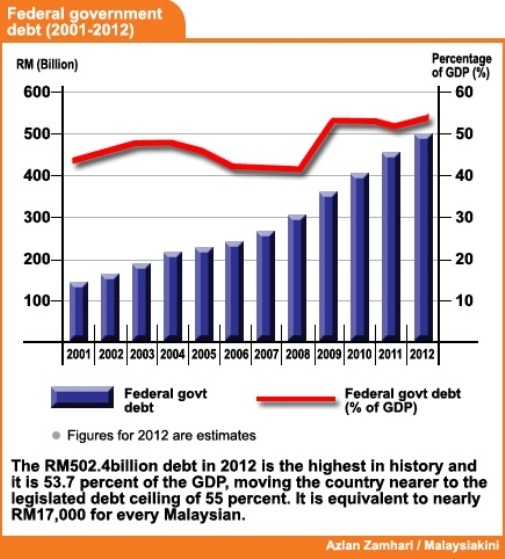 According to the 2011 Auditor-General’s report, our national debt stands at a whopping RM456.12 billion! At the rate the government is splurging on handouts, vouchers and bonuses, our country will soon go the way of Greece, and will require a massive bailout to staunch the fiscal haemorrhage. There are stories going around about where the government is dipping its hands into for funds. Whether the stories are mere rumours or not, retirees like me do not want to wake up one day to learn that our retirement savings have been siphoned off without our permission to boost the public image of the government. Public-listed companies have CFOs and COOs to caution their CEOs to be prudent about spending. CEOs are answerable to the Board of Directors and to the shareholders. Who will take the PM aside and remind him of his real responsibilities to the people? Christmas is over. There's no need to play Santa Claus anymore. Please. I hate this high handed practices which is obviously vote buying. What else do you think the BN government is trying to do if not win votes using money intended for development? My fear is some people gets addicted to this 'culture' that they expect future governments to continue the practice and use it to sell their allegiance. Obviously Najib doesn't care the consequence of this dangerous precedence he created. I agree. This is not only crazy but irresponsible and create a dangerous appetite from some voters, including those old enough to vote in future, to demand such handouts in exchange for their allegiance.